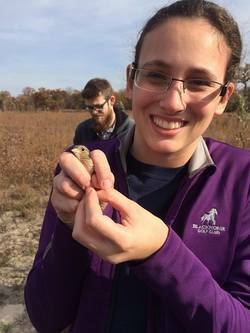 Stephen F. Austin State University graduate student Courtney McInnerney is investigating the potential recovery of grassland-dwelling bird species on a multi-phased restoration project initiated by the Texas Parks and Wildlife Department in 2007. McInnerney, who is pursuing a Master of Science in environmental science at SFA's Arthur Temple College of Forestry and Agriculture, said that at this point in the restoration process she is seeing the transition from woodland to grassland bird species such as dickcissels and lark sparrows. Pictured, McInnerney holds a dickcissel that was captured and released during fieldwork. The vast landscape of Texas has experienced myriad changes since Anglo-American colonization began in the 19th century. From the loss of bottomland habitat to the extirpation of native wildlife species, alterations in land use and management have produced far-reaching effects across the state's 10 ecoregions that span from the Piney Woods to the Trans Pecos. "Post oak savannas are considered among the most threatened vegetation types in North America," said Courtney McInnerney, a graduate student in Stephen F. Austin State University's Arthur Temple College of Forestry and Agriculture. McInnerney, who is pursuing a Master of Science in environmental science, explained that natural disturbances, such as frequent fire and grazing, historically maintained the oak savannas, which range across the Midwest and into Texas. The reduction or elimination of these disturbances, however, facilitated woody vegetation encroachment and loss of habitat for wildlife species associated with the ecosystem. "Oak savannas were once an abundant vegetation type in the Midwest United States but have now declined to less than 1 percent of their original range," McInnerney said. Because of this drastic decline, numerous state and federal agencies, as well as nonprofit organizations, are engaged in long-term restoration projects to help restore this ecosystem and the wildlife that depend upon it. Under the direction of Dr. Christopher Comer, professor of wildlife ecology at SFA, McInnerney is investigating the results of one multi-phased restoration project initiated by the Texas Parks and Wildlife Department in 2007. Prior to the implementation of restoration efforts on 370 acres of the Gus Engeling Wildlife Management Area located in Anderson County, a former SFA graduate student conducted bird surveys to gain a better understanding of the populations present in the degraded oak savannas. This pre-restoration reference provides researchers with valuable data allowing them to monitor the transition of bird species through pre-to-post restoration, shedding light on best practices and guiding future management efforts. McInnerney said the restoration area was cleared in a manner that preserved mottes, or groups of trees, to mimic the historic vegetation structure. Since then, the area has undergone a prescribed burning regimen, as well as periodic applications of herbicide to control re-sprouting woody vegetation. The implementation of these management practices released native savanna grasses that had long been suppressed by the shade of an overgrown tree canopy and reclaimed the desired habitat and breeding conditions for native birds that include the Eastern wild turkey and Northern bobwhite quail. "Right now, we're seeing the shift in bird communities from woodland birds such as Carolina chickadees, Northern cardinals and tufted titmice, to more grassland birds such as dickcissels and lark sparrows," McInnerney said. Documenting these species entails far more than hobbyist bird watching. On a bi-weekly basis, McInnerney and her research assistant systematically walk 16 precisely measured transects distributed throughout nine fully-restored, thinned and non-restored areas while documenting the species, location, time and method of detection for each individual bird. Following detection, McInnerney must then search the area for nests to document breeding status and nesting success of target species. As she enters her final field season, McInnerney said she has already observed multiple female dickcissels carrying nesting materials. While this is promising evidence that restoration efforts are working, she said more data is needed regarding breeding and nesting success, as well as grassland bird recruitment to constitute a full recovery. To learn more about this and other research occurring through SFA's Arthur Temple College of Forestry and Agriculture, visit atcofa.sfasu.edu.